You are currently browsing articles tagged jesusita. 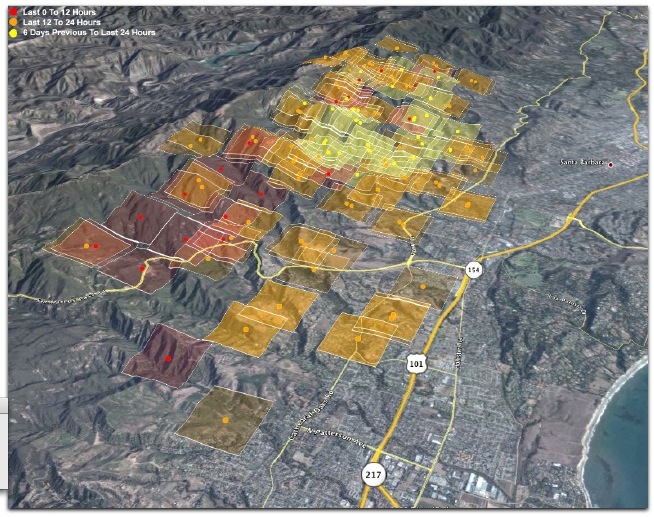 The country behind Santa Barbara is burning again. This one is the LaBrea fire, east of Santa Maria. It has grown past 36,000 acres and is 10% contained. This is far north of the fire in Santa Barbara earlier this year. Still, it’s a big one. The view is toward the east. 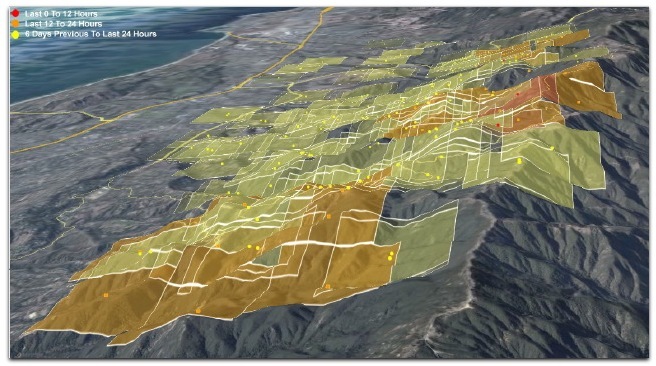 The LaBrea Fire is on the left, on the north side, and the little dots along the coast on the right are visualizations of MODIS data from the height of the Jesusita Fire earlier this year. In the foreground along the coast is Vandenberg Air Force Base, plus lots of sand dunes, advancing southeastward. It will sure spread some more, but we can see the end coming. Here’s the whole photo set. And here’s the latest update on exactly what burned (addresses and all) from Matt Kettmann (Contact), Sam Kornell , Chris Meagher (Contact), Ben Preston (Contact), Ethan Stewart (Contact) of the Independent. 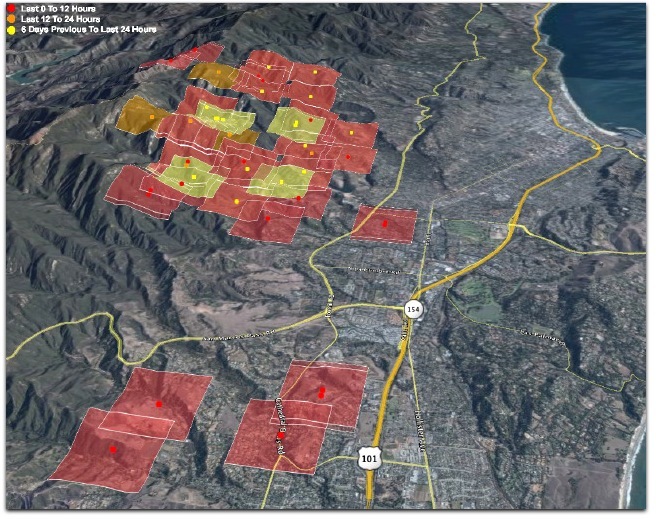 The bad news is that the fire still threatens parts of Goleta to the west, the Painted Cave community to the north, and, to the east, parts of Santa Barbara and Montecito, where the evacuation order was just extended once again. Those Indy folks did — and are still doing — an outstanding job, deserving of whatever rewards are coming their way. Great work by everybody else reporting on the fire as well. Kudos all around. 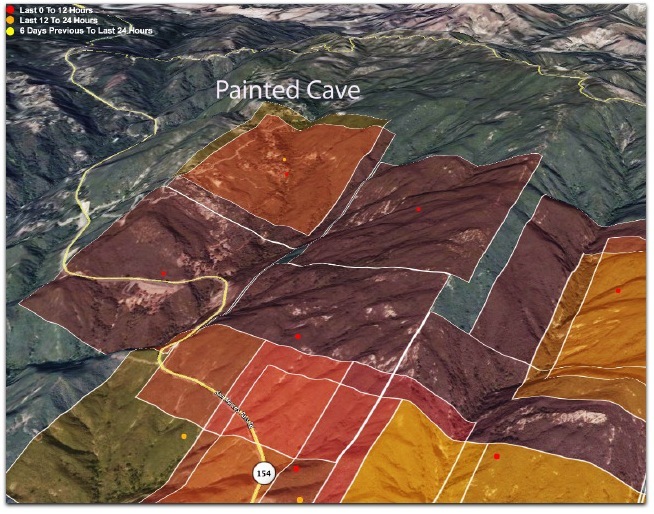 Here is a great map that shows all three fires in the last year, as well as good information about the ongoing Jesusita Fire. @Jesusitafire, of the Los Padres National Forest, is tweeting. So far following ø, followed by 12. Hey, it’s a start. The shot above looks west from the eastern flank of the Jesusita fire, above Montecito. The overlays are MODIS (the dots and squares) and GEOMAC (the red line). I think the GEOMAC data is older, but I’m not sure. Both were downloaded at about 4:42am, Pacific time. The newest detections are red and the oldest are yellow. They are from instruments on satellites and may or may not indicate major fire activity. One during the Tea Fire suggested that the fire had spread far down into the Riviera district and toward town. When I checked the spot, it turned out to have been a fire in part of a small isolated oak tree. No fire had spread to or from there. 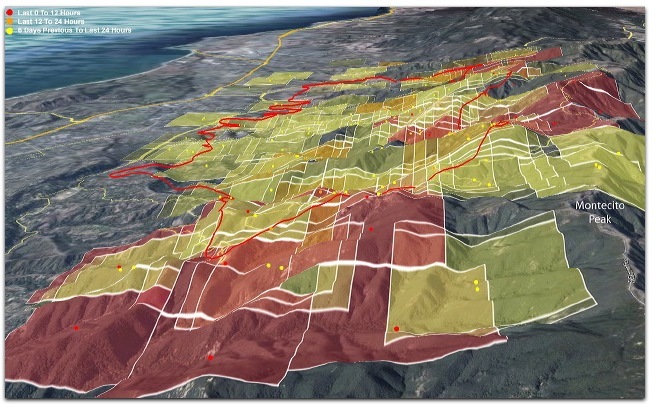 Still, the data do show changes in the fire’s approximate perimeter over time. Step through this photoset and you can see how the fire has gone over the past few days. Sean Trek has a way of seeing MODIS with radiative power. It looks to me now like the next challenge, after saving lives and homes, is keeping the fire from burning for many more days or weeks across the back country. The trick here is to let the fire take nature’s course while also keeping it away from civilization. It is a significant fact that California’s state tree (the Coast Redwood) and state flower (the California Poppy) are both adapted to fire. One might also make the case that the latter is adapted to earthquakes. Life everywhere is a losing game with death. We just hope that the substantive things we do and build will outlive us. In much of California, the chance that our homes will outlive us is smaller than most other places. Some homes lost in the Tea Fire had replaced homes on the same property that had burned in 1964 Coyote Fire and again in the 1977 Sycamore Fire. Among disasters that might befall homes in California, only earthquakes are more certain to occur, and in more places. Hence the higher insurance costs. But still the graces of living here are exceptionally high. Mild, sunny weather. Clean air. Beautiful mountains and beaches. Wonderful people. Excellent university. So we do. And every day we should thank the heroic work required of the firefighters who keep the worst of nature at bay. Posted 5:38am, Pacfic. The LA Times has a story on the fire, dated 10:28pm last night. A news conference is scheduled for 8am. Just heard that on KNX, which has done an excellent job covering the fire. 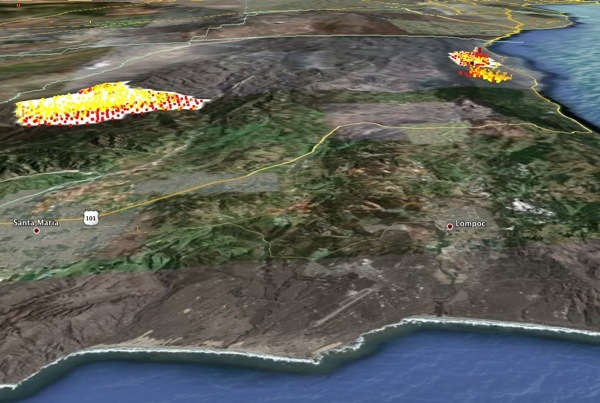 The news that matters is that the fire is “contained” along the northern border of Santa Barbara. Thus spake SB Fire Chief Andrew DeMizio (who always starts by spelling his name). He was glad to see “that black line” on the new Incident map. Contained does not mean put out. He had another word for that, but I forget what it was. The language is interesting. A fire is an “indicent”. Police, fire, Red Cross and other personnel are “assets”. Lifting an evacuation order is “repopulation”. My kid just said, “I thought ‘repopulation’ was what you got after the first population has died”. Inexcusable, if true: No questions about locations still apparently threatened. (Could be that somebody asked and I didn’t hear it.) Specifically, the only two communities up in the Santa Ynez Mountains, overlooking the city: Painted Cave and Flores Flat. I gathered from the Indy story mentioned above that Painted Cave was okay. But the only way I knew that Flores Flat survived was from a little human interest feature that KNX has been running over and over again: comments by a woman who gave advice about what to take and what to leave behind. She said she had resigned herself to losing her home in Flores Flat, but was surprised to find it had survived. Frankly, I’m amazed that Flores Flat is okay. I’ll bet the firefighters gave special attention to that one. Maybe one of the places where the DC-10 laid down some of its 12000+ gallons of fire retardant was between Flores Flat and the fire. 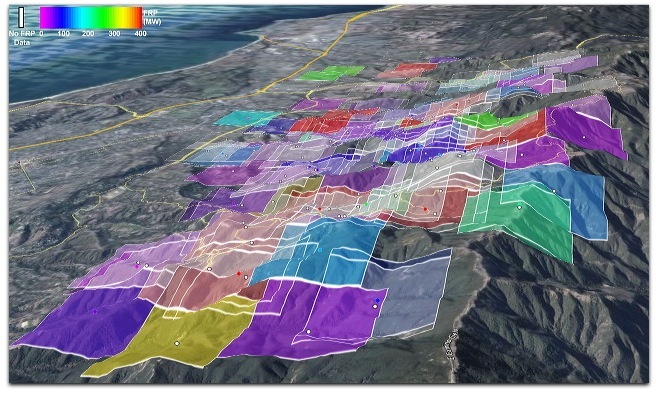 Flores Flat is far up Gibraltar Road, between Gibraltar Peak (where many of Santa Barbara’s FM stations radiate from, including KCLU and KTYD) and the site farther up the mountain face where hang gliders and paragliders launch toward the city when the winds are right. 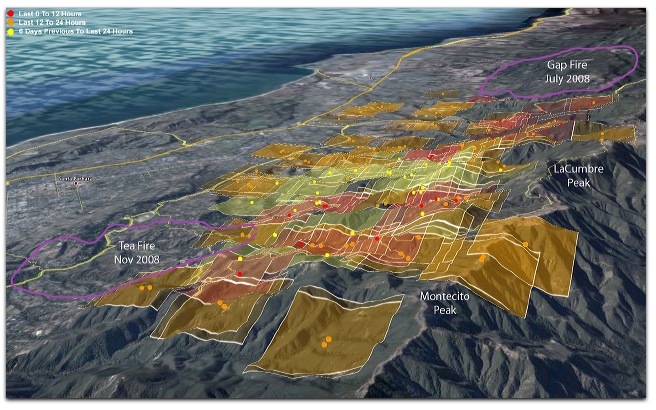 From the looks of the map and overlays above, the fire movement was eastward away from Gibraltar, and up and over the crest of the ridge near Montecito Peak to the east and LaCumbre Peak to the west. The Tea Fire surely created a fire break as well. It burned much of Gibraltar road, and up the face of Gibraltar Peak, where it roasted the antennas of KCLU and many of the other stations there. KTYD and its AM sister KTMS are located a few hundred feet above and behind there, so they survived. To the west of there are some of the main power lines that supply the city. As I recall those lines are draped quite high, and I suppose survived the fire as it approached Gibraltar road this time. Other high power lines coming into the Goleta side of town were hurt in the Gap Fire last summer, knocking out power for much of the city at the time. A major fire in town didn’t stop the Santa Barbara News-Press from doing business as usual. In this case, “business as usual,” meant laying people off. This time, the unlucky employee was Jued Martinez. He was a digital image technician for the paper, the “go-to-guy for Photoshop issues,” as he put it, working in the camera (pre-press) department for many 15 years. To witness how retro and self-destructive the News-Press is, go to their Jesusita Fire Coverage page. Click on a story. Say, this one. You get one sentence. Then you’re told to long in. Subscribers only. Hell, even when we were subscribers, we couldn’t get in there. I’m sure it all disappears or scrolls behind a paywall after a few days in any case. Gone like snow on the water. With the radio stations, I mean their streams, not their sites. The fire is only a few hundred yards from Foothill in the San Roque area, but doesn’t appear to be burning any houses at the moment thanks to the firefighters concerted effort to hold Foothill Road. Collected Independent coverage. 3:28am Copied from a byline: Ray Ford, Matt Kettmann, Chris Meagher, Ben Preston, Nick Welsh. These guys are doing a great job. Near as I can tell, the Indy is the only news organization with reporters working the fire around the clock. Outstanding work. I listened to the first three or four speakers in the 8am press conference, and then made the good chap I had an appointment with wait while we both listened to see if anybody would say what listeners most wanted to hear: what homes were lost, and what homes were most in danger. I hate to be critical of people doing heroic and much appreciated work, especially when it is quite true — as these speakers said — that many more homes were saved than lost, and at great risk and effort. I’ll just say it was frustrating not to get specifics about homes. Maybe they came around to it eventually. I don’t know. Eventually I had to turn off the radio (actually an iPhone tuned to KTYD) and get on with my meeting. 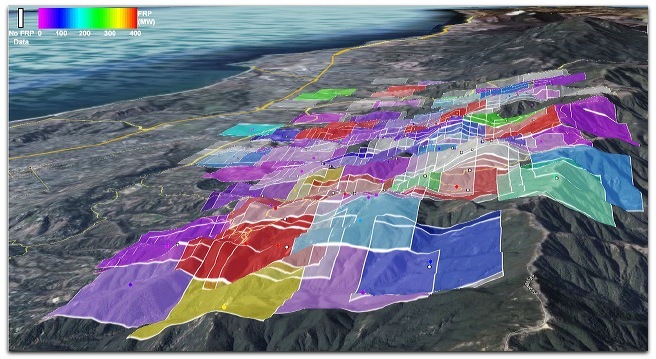 Although the task can be difficult in a wildfire zone — especially one with as many twists, turns, and long driveways as the foothills of Santa Barbara — The Independent’s reporters are trying their hardest to deliver what everyone who’s evacuated wants to know: the addresses of homes that have not survived the Jesusita Fire. We are fully aware that mistakes in this sort of reporting could be horrible for homeowners who get the wrong information, so we’ve strived for the utmost accuracy. Furthermore, based on responses we’ve already received during this fire and others, we believe that this public service is one of our most valuable roles as a media entity, and hope you find the information useful. As of 1:30 p.m. on Friday, the following is what The Indy’s team of reporters has been able to put together. Then the list, with very careful qualification. Excellent stuff. If the Indy doesn’t get an award for its fire coverage, there is no justice in Officialized Journalism. There’s a press conference going on. I’m listening on KNX/1070. Also KCLU/1340/102.3. The KCLU stream (which is what I’m now listening to, here in Boston) is here. 5:14pm.